Easy to use and very durable, the Deluxe Work Tent features quick set-up from the inside or outside with fiberglass rod frame. These frames are uniquely designed to not pull out or poke through the fabric. A handy attached roll-up flap provides compact storage, easy transport, and means no missing storage bag. Offered in three sizes, it is available in a one door design with zipper closure, or a two door design with one zipper and one roll-up door. The pitch roof style provides extra headroom, structural strength, and repels snow and water. Frame rods are bolted for increased stability and the unbreakable hinges are made of rolled steel. The free-standing structural stability is excellent in windy conditions. 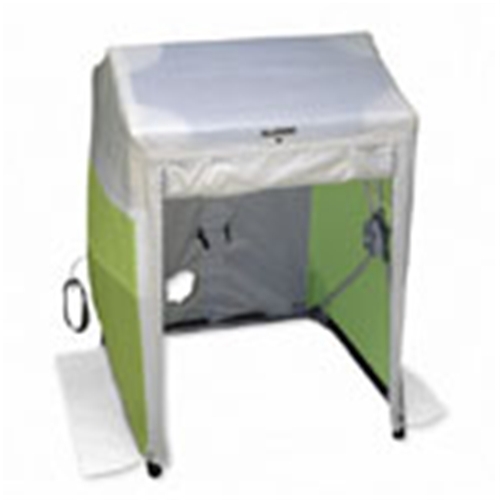 For safety, side panels are high-visiblity green, and the white color of the tent allows proper lighting for color matching. Included is a blower duct tube in the rear of the tent, and a covered window. Flame retardant.